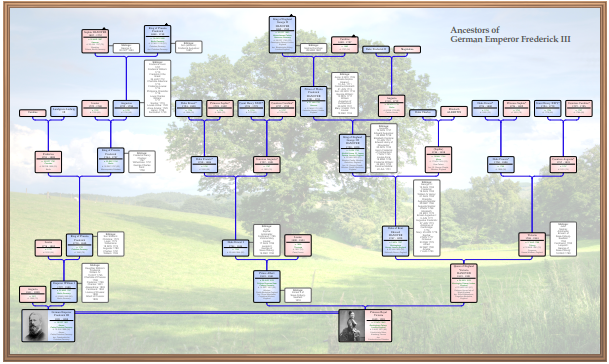 Now you can create great family tree charts without the restrictions of your own software. Then we can print it for you on a range of quality papers and archival inks*. Now with the option to add backgrounds and borders, you can create really attractive looking charts! All fully configurable! 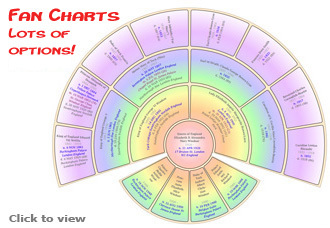 Choose from 10 basic chart types, with the options of 27 different borders and 16 different background images or textures. Our aim is to print your family tree charts in the most cost effective way. Just input your data or upload your GEDCOM file, design your chart on screen, and we will print a high quality chart for you using archival quality ink and a range of papers, including canvas and true archive quality paper. See here for more details. You choose the appearance of your chart. Our software will lay out your chart for you, but then you can add notes, pictures and additional captions and place them anywhere on the chart. For line charts you can move the boxes around, even 'collapse' individual families! When you are happy with the layout, just add it to your basket. Includes features you will not find anywhere else. Probably the most powerful chart design software you will find on the web! No problem. Use the site to manually input your family tree, with a fast and easy data entry screen that is simple to use. It costs nothing to use the site to design your charts. You only pay if you want your charts printed. * Note that our budget 80gsm charts use conventional ink. All other papers use archival ink. Just click the box above for 5 easy steps to create your first chart. We don't just print what you see on the screen. Our software creates a high quality PDF file from your chart design, and we then print this to a high resolution on your choice of quality paper. If you choose our budget option of standard 80gsm paper, it is so inexpensive to print your charts you can keep a chart as your working copy and just get us to reprint it when you make changes! Before you get too carried away, we strongly suggest you check out the help files, available from here.